When the first song played I thought, Oh Lordy, does Alvin Lee never cease to get into that ticklish spot along the back of your neck and make you tingle all over. I was thrilled to think we’d hit a triple and all three of my Ten Years After albums would make it onto the Ram alternative list. But that soon fizzled and I didn’t even recognize any of the other songs, not even Alvin Lee’s version of Chuck Berry’s “Sweet Little Sixteen.” This album, although all songs were written by Lee, except for “Sweet Little Sixteen,” seems to have highlighted the talents of the other members of the band more than the other two albums, which was nice for them, I guess. We already mentioned bassist Leo Lyons, whose last name is actually Lyons, and who played up his moniker with a subtly obvious lion’s mane, slightly oversized mustache, and suede lion-tan jacket. He and Lee co-founded the band, Chick Churchill was keyboardist and Ric Lee (no relation) was the drummer. They were most popular in the late 1960s to early 70s, broke up, got back together, and had other people in the band. Alvin Lee played with them early into the millennium, passed away just last year, and the other three have been playing together until this past January, according to Wikipedia, when Lyons left. 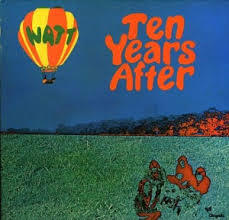 ← April 22 – Tuesday – Ten Years After – Ssssh.